If it’s history you’re after, there’s plenty to see. Medieval villages, churches, abbeys and monasteries. Among the most interesting is La Couvertoirade in what is known as the most beautiful village in the Cevennes. 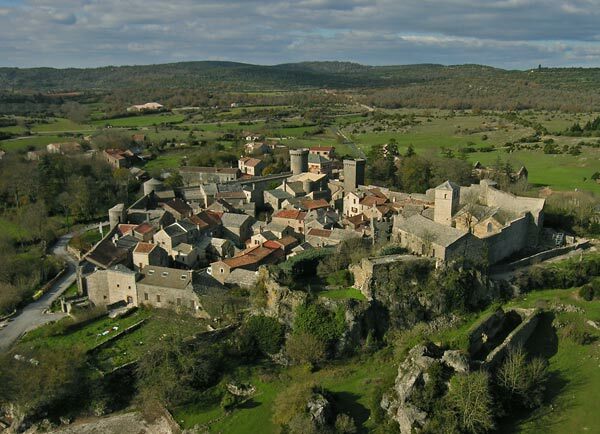 This medieval village on the Larzac plateau, reflects the military power of the Knights Templars and the Knights of Saint John of Jerusalem, also known as the Hospitaliers. Well preserved, the Templar Commander of Saint Eulalie de Cernon ordered the construction of a castle in the 12th century. In the 14th century, the knights of Saint John built the church and a hundred years later, erected the enclose and towers which can be perfectly seen today. La Couvertoirade was baptised ‘la plaine du temple’ or the temple plain and was considered one of the great properties of the Knights Templars. For seven hundred years, La Couvertoirade sheltered the Templars and the Hospitaliers, who took over following the abolition of the Templar order in 14th century. The square towers are connected by a rampart walk so it’s not difficult to imagine the knights walking around the ramparts to protect their secret practices so many years ago. Walking around the medieval city gives you a sense of a marketplace in the middle ages. Most houses have an exterior staircase leading to upstairs living quarters and the ground floor, vaulted roofs shelter where the sheep would have been enclosed. Here you may find many artisan shops offering a variety of local craft work.